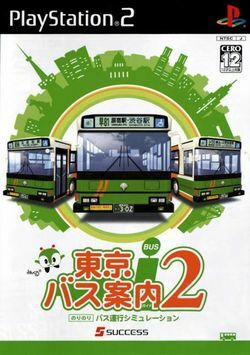 Tokyo Bus Guide 2 is a Japan-only Bus Driving simulator released for the PlayStation 2 in 2005. In this game, you drive a bus on a route through Tokyo, picking up and letting off passengers at the bus stops. The Tokyo Bus Guide series is similar Crazy Taxi, as they both involve carrying passengers through the city, but unlike Crazy Taxi, Tokyo Bus Guide strictly requires you to follow all of the rules of the road, right down to using your turn signal when changing lanes. This page was last edited on 8 February 2011, at 15:57.